During NASA’s next Robotic Refueling Mission 3 (RRM3), testing tools and technologies for repairing and refueling satellites in orbit will not be the only demonstration happening aboard the International Space Station. An advanced, highly compact thermal camera that traces its legacy to one currently flying on NASA’s Landsat 8 has been fitted in a corner of the RRM3 payload and from that spot will image and videotape Earth’s surface below once the SpaceX Dragon resupply vehicle conveys the payload to the orbiting outpost in November. While RRM3 demonstrates its specifically developed satellite-servicing tools designed by NASA’s Satellite Servicing Projects Division, its hitchhiker companion, the Compact Thermal Imager (CTI), will image and measure fires, glaciers, ice sheets, and snow surface temperatures. CTI will also measure the transfer of water from plants and soil into the atmosphere - vital measurements for obtaining insight into plant growth. Many of the conditions that Earth scientists explore, including these, are easily identified in the thermal or infrared wavelength bands. CTI’s enabling technology is a comparatively new photodetector technology called Strained-Layer Superlattice (SLS). Besides being very small, measuring almost 16 inches long and six inches tall, SLS consumes minimal power, works at liquid-nitrogen temperatures, is easily fabricated in a high-technology environment, and is economical “almost to the point of being disposable,” said Murzy Jhabvala, a detector engineer at NASA’s Goddard Space Flight Center in Greenbelt, Maryland. Jhabvala worked together with his industry partner, the New Hampshire-based QmagiQ, to create the SLS detector assembly. The detector technology can also be rapidly and easily tailored for various applications, he added. The Goddard Detector Development Laboratory, for instance, in recent times fabricated a 1,024 x 1,024-pixel SLS array and plans to expand its size to 2,048 x 2,048 pixels in the immediate future. Another enabling technology that CTI and its SLS detectors will use is the Goddard-developed SpaceCube 2.0, a robust hybrid computing system that will regulate the instrument and process the images and video that it captures while in orbit. SLS is founded on the Quantum Well Infrared Photodetector (QWIP) technology that Jhabvala and his government and industry collaborators spent over twenty years refining. The QWIP detectors are currently operating on Landsat 8 and will be flying on the forthcoming Landsat 9 Thermal Infrared Sensor Instrument, which Goddard scientists designed to track the ebb and flow of land-surface levels and the health of vegetation - data that western states employ to track water consumption. Similar to its QWIP predecessor, SLS is a large-format detector. The arrays are fabricated on a semiconductor wafer. The wafer’s surface comprises numerous alternating, very thin layers of differing materials that are epitaxially grown and modified to absorb infrared photons and change them into electrons - the important particles that carry an electric current. Only light with a particular energy, or wavelength, can discharge the electrons. A read-out chip directly mated to the array then transforms the electrons to a voltage that a computer uses to reconstruct an image of the infrared source. The CTI can also capture video from its orbit almost 249 miles above Earth’s surface. In contrast to its QWIP predecessor, SLS detectors are 10 times more sensitive and work over a wider infrared spectral range and at considerably warmer temperatures—70 K (about -334 °F) for the SLS array compared with 42 K (about -384 °F) for the QWIP array. The increase in working temperature will have numerous positive effects on future missions, Jhabvala said. Infrared radiation is detected as heat. 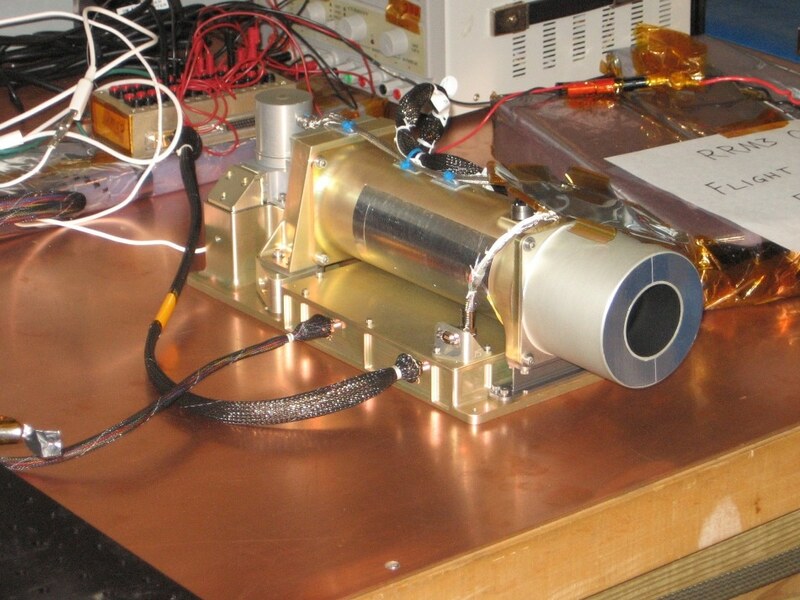 Thus, detectors engineered to measure infrared wavelengths must be cooled to prevent heat produced within an instrument or spacecraft from tainting the measurements of the object being observed. That is why cryocoolers and other devices are used by engineers to keep the detector arrays and other critical instrument components as cold as required. As Jhabvala and his team have built an array that can function at warmer temperatures, its cooling system is smaller and guzzles less power. In the future, these attributes will result in smaller satellites, shorter build cycles, better longevity, and a lower cost, Jhabvala said.